If you've never visited Portsmouth by boat, add it to your list! Especially if you want see first-hand historic colonial New England during the 4th of July. With an ocean breeze in the air and our 4th of July weekend around the corner, our family of three was looking for a fun family-friendly spot to tie up for the weekend. Historic Strawberry Banke and Portsmouth, New Hampshire had exactly what we were looking for. We live in southern Maine, so we were lucky to be somewhat familiar with the Portsmouth area and the amenities. For the uninitiated: Portsmouth is jammed-packed with historical tours, family-based activities and dining options for all ages. With the beauty Portsmouth and Kittery have to offer, it’s still important to remember that the Piscataqua River’s reputation as the second fastest flowing tidal river in the continental United States is very real! 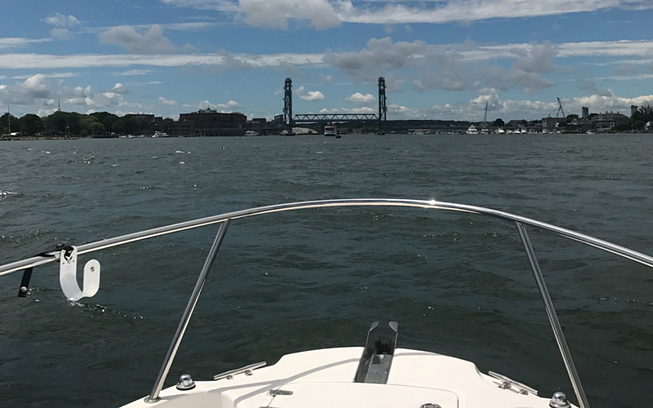 Current can range anywhere from 3 to 6 knots based on the outgoing or incoming tide, so it’s important as you pull into port to communicate with the harbor on VHF. Nestled on the Piscataqua River, which separates Portsmouth and Kittery, Maine, Prescott Park is the perfect location to tie up at for easy access to summer concerts, fireworks, exploring town, and finding the freshest lobster New England has to offer! 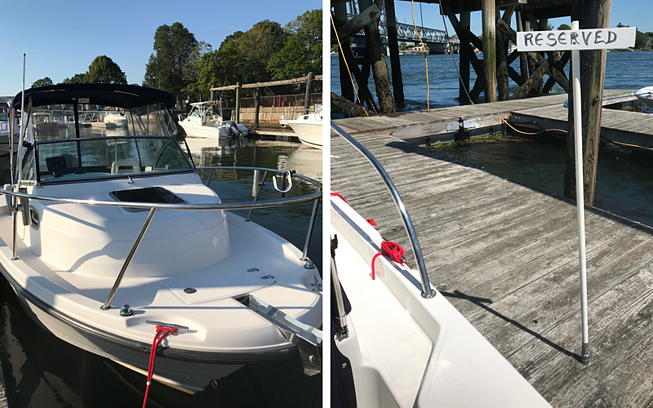 The facility and team at the Prescott Park Docks in Portsmouth make docking your vessel of any size a breeze. As we pulled into dock, we radioed ahead on channel 9 and were assisted by Brad Keaveney in docking our Whaler due to a very strong current that afternoon. With two hands and a spotting eye, we felt more than comfortable coming in and out of port during our stay. 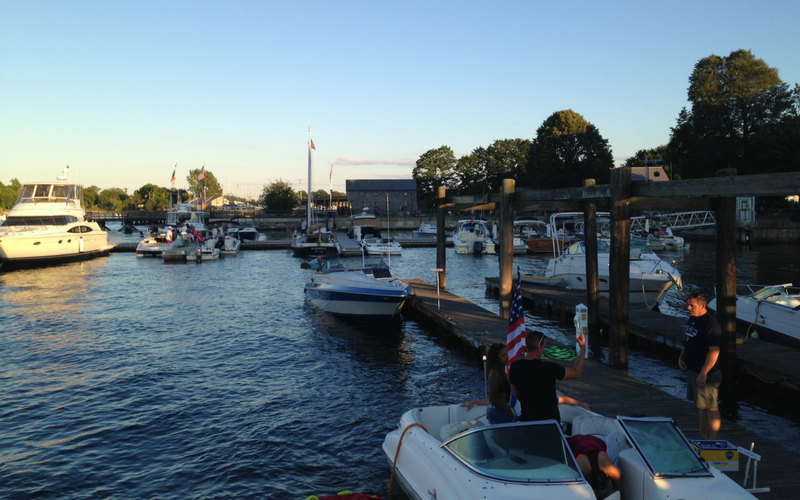 The marina property encompasses more than 10 acres of seaside lawns, gardens and walking paths, three boardwalk piers and two public docking areas with space for up to 26 vessels. The dock spaces were full due to the 4th of July, but not overly rowdy. Mostly families and recreational fishermen trying to catch plenty of striped bass that make their way up and down the Piscataqua River. 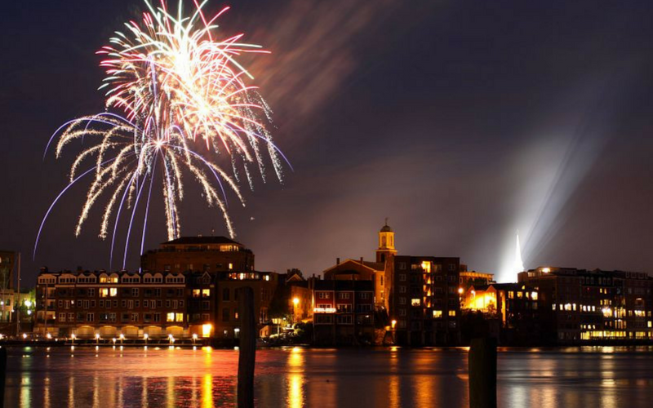 Portsmouth has a long-standing tradition of hosting one of New England’s finest displays of fireworks on the 3rd of July. Thats right: the 3rd! Ringing in the 4th lets residents and tourists alike enjoy a few days of Independence Day activities. Since we had family in the area, they met up with us on our Boston Whaler Conquest at dusk to catch a display of pyrotechnics that seemed to last for 45 minutes. This year the city entered a 10-year partnership with Wilcox Industries Corp. as a sponsor of Independence Day festivities, which enables the City of Portsmouth to expand their 4th of July celebration. 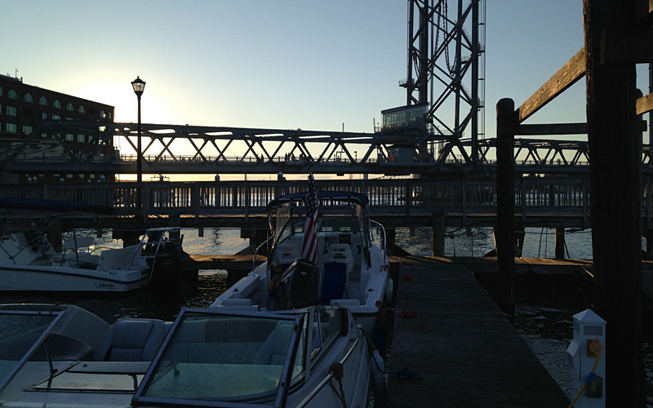 So we expect to spend many more years enjoying the 4th at the docks! Brad and the staff at Prescott Park were super friendly, and periodically checked in with us during our three days at the dock to make sure everything was going well. He even offered to upgrade our location to get a better view of the evening’s fireworks as a sailboat was set to check out that afternoon! After we settled in, we enjoyed some great local restaurants, a quiet picnic in Prescott Park, and went stand up paddleboarding around New Castle Island. Walking around historical Portsmouth while you are docked definitely has its advantages: we didn’t have to worry about searching for parking in town and we were in walking distance to some great seafood. Morrison’s Lobsters was a highlight for us, which is just a short walk across the Memorial Bridge form the dock on Badgers Island in Kittery, Maine. Perfect steamers, corn and lobster! Our time in Portsmouth seemed to fly by! We were scheduled to check out on the 4th so we left early in the morning, mostly due to a 5AM wake-up call from our one-year-old. We figured we'd take advantage of being up early on a holiday and spend a family day on the boat returning home. 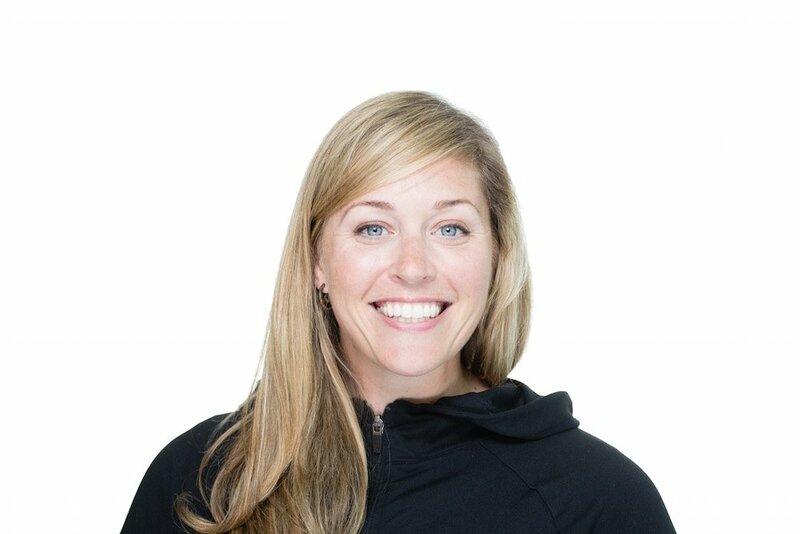 Reserving through Dockwa made checkout a breeze: a simple handshake and we were on our way. 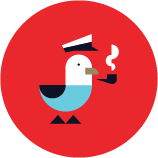 We couldn’t have been happier with the ease of use with the Dockwa app combined with the know-how of the staff at Prescott Park Docks! Thanks so much to Mike and Liz Norcia of Kittery, Maine for sharing their 4th with us! 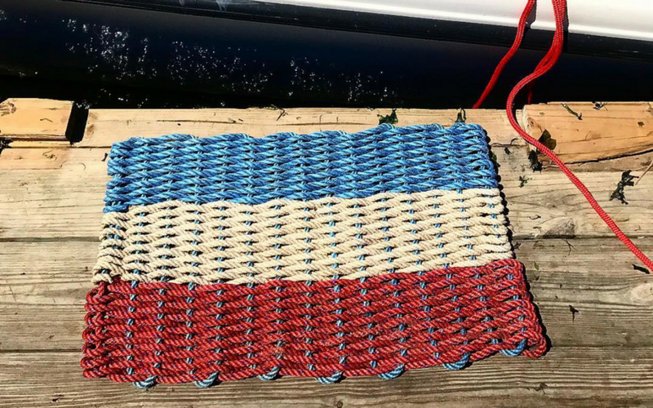 Check out Stern Lines, their line of recycled home goods (pictured above) made from reclaimed lobster rope! Want to see more information on Prescott Park Docks? Read reviews and find more information on Marinas.com.